In the years immediately after the war of 1812, the north end of the Indian Lands of Glengarry and the adjacent north part of Roxborough township, were being settled. The people who settled there, were largely Protestants from Perthshire in Scotland and mostly from the parishes of Weem, Aberfeldy and Killin. Though they were Protestants and to a large extent, inter-related, there were three sects among them, Presbyterians, Congregationalists and Baptists. None of these sects were numerous in themselves, nor did any of them have a minister of their own, yet in common, right from the first they recognized two necessities, a place to worship their God and a place to bury their dead. At first the folk without regard .to sectarian differences, met for prayers in homes and from time to time, they had a minister come to make. their worship more formal - Congregational and Baptist ministers from Breadalbane and Presbyterian from Martintown. In 1915, or very shortly thereafter, the community built themselves a log church on Lot 9 in the, 17th concession of Indian Lands, just south of the area where the Maxville cemetery vault stood for so many years, in the 20th century, and just across the road from the southwest corner of the present Maxville cemetery. In this "Beech Ridge Church", built of beech logs, the three sects held services, turn about for some 10 years. At the end of that time, there was a settler on nearly every lot and the three sects felt themselves strong enough to built themselves separate churches and eventually, they all did. The Presbyterians built almost across the road from the Beech Church, in the center of the present Maxville cemetery; the Baptists at Notfield and the Congregationalists at the present St. Elmo. Even before the Beech Church was built, burials had to be made and the settlers selected a spot on the south side of the 17th Concession road (the first road running west south of Maxville ) Today this spot can be identified as being astride the lot line between lots 12 and 13 17, Indian Lands. 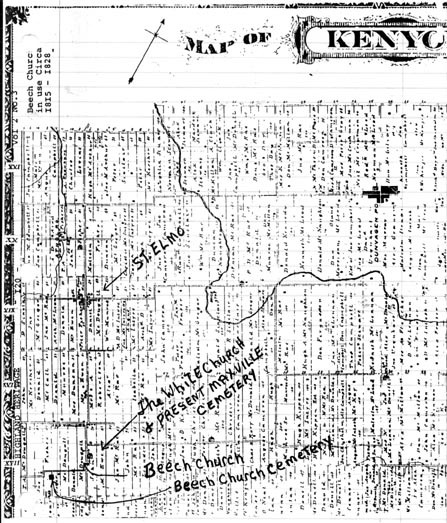 When the separate churches were built, other cemeteries came into use and eventually the few graves in the small cemetery on the south side of the 17th concession road were abandoned and forgotten, except for the men who owned and worked the land they were on, Bentons; Fishers; McDougalls and MacKillicans. They never plowed the land over the sunken graves that marked the old cemetery site. details from him. However, his son Herbie who has been long resident in Pointe Claire, Quebec, came to the rescue, and he was able to pinpoint the old cemetery site. A recent letter from Herbie says, "he remembers the place where the old cemetery was on his father's farm", and lie added, "there used to be a woman in Apple Hill who had a record of the burials in the old cemetery, but I can't remember her name." We can hope that this old cemetery record still and that it will come to light. If it does, all of us who are interested in Glengarry's history, will owe something to Herbie MacKillican.